In the latter part of last year that #thewatchnerd arranged for a joint visit to the Fabergé boutique in London, which had kindly agreed to showing us some of their watches. We had been motivated by the desire to see the new Visionnaire DTZ, but found ourselves staying not just for that, but also for the Lady Compliquée Winter. The latter is notable for its movement, which made its debut in the Peacock watch. 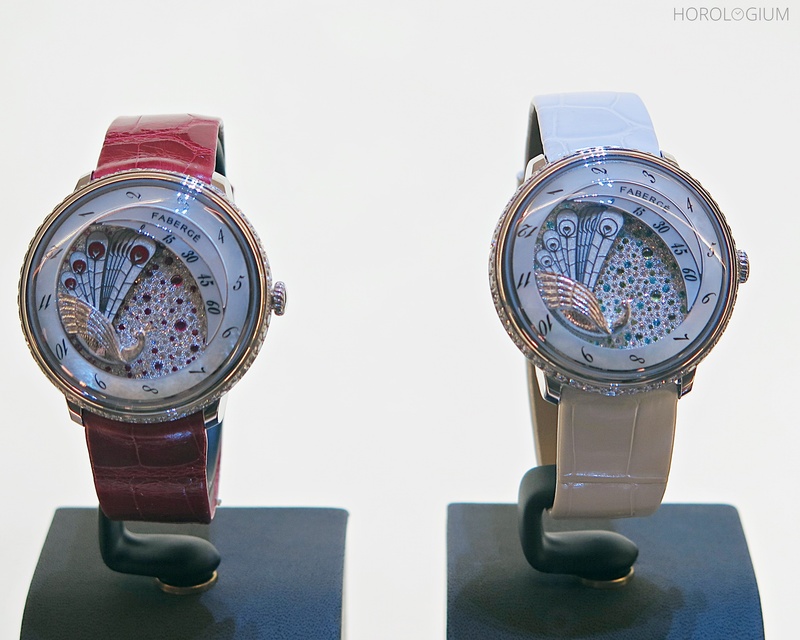 At Baselworld 2015 Fabergé and Agenhor launched the Lady Compliquée Peacock. With a retrograde time display at its time telling centre, there are fanned blades that spread the peacock’s feathers gradually over the course of an hour, indicating the minutes on a scale and the hours via a rotating ring, with the four moving blades flying back to their original position with the passing of an hour. Based on a 1908 egg which contained a bird automaton that could spread its wings, in this watch the first feather moves forward by 15 degrees per hour, the second by 30 degrees per hour, the third by 45 degrees, and the last by 60 degrees. This is achieved by an Agenhor invention that they have called AgenFAN, made of two series of toothed wheels of increasing diameters on one and decreasing diameters on the other which are superimposed on the same axis. They are placed side by side and mesh along their length. The first toothed wheel is driven by the spindle of the hours cam (the hours cam is beneath the visible hours ring) and drives the second, which powers each of the blades. This complex and really rather glorious new way of doing a retrograde time display was recognised with a win in the ‘High Mechanical’ category at the Grand Prix d’Horlogerie de Genève (GPHG) in 2015. 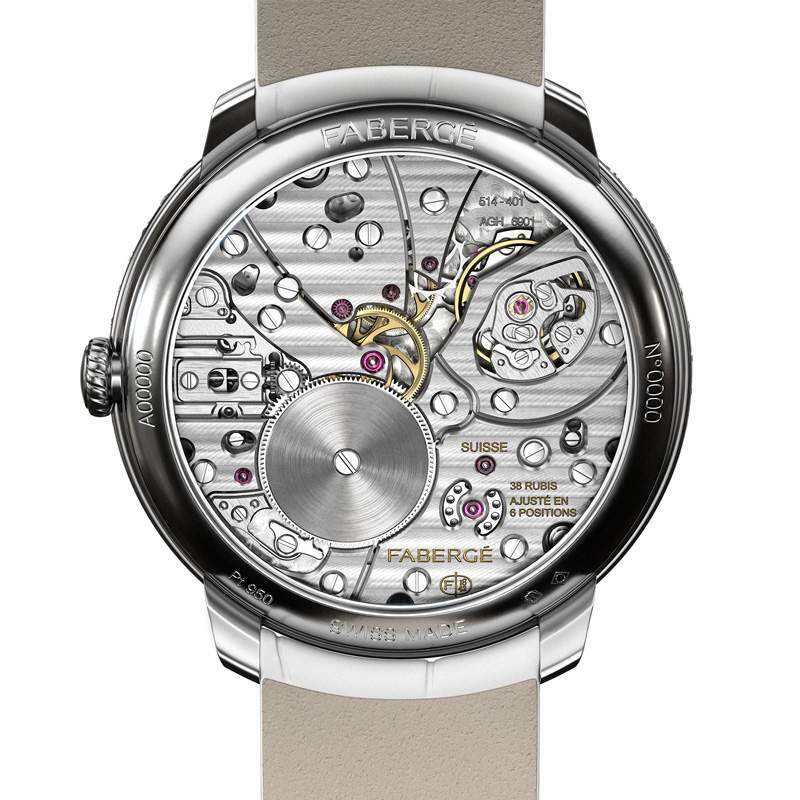 Powering the fanned retrograde time display is the manually wound Calibre 6901, which has a diametre of 32.7mm and a power reserve of 50 hours, beating at 21,600VPH. It is visible through the case back and has horizontal Côtes de Genève decoration on the bridges, and circular graining on the main plate. 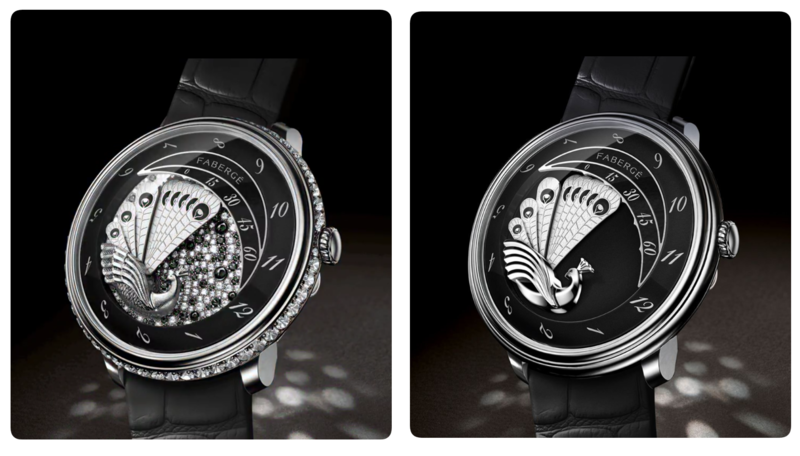 At Baselworld 2016, following on from the original, the ruby, and the emerald, the a new one appeared – the Lady Compliquée Peacock Black Sapphire. 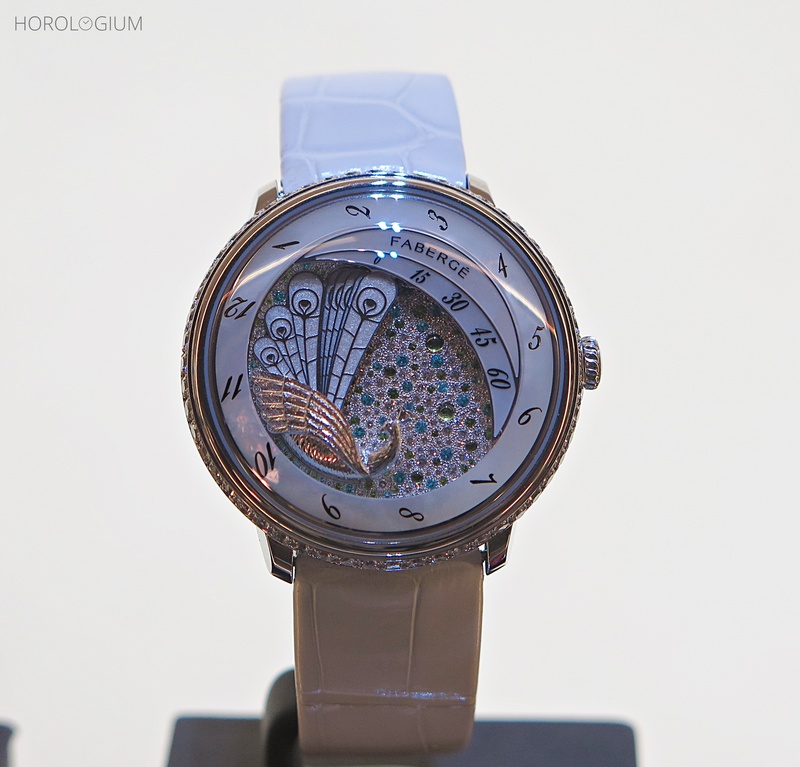 It featured an 18 carat gold dial with snow-set diamonds (157), black sapphires (59) and black sapphire cabochons (6), with the hand-engraved peacock in 18 carat white gold. Surrounding this dial are an onyx rotating hour ring, minute track, and and minute and hour indicators in black lacquer. All of this is inside a 38mm platinum case (and crown) and adorned with a bezel set with 54 brilliant-cut diamonds. The strap is alligator, with a matching platinum Fabergé pin buckle. 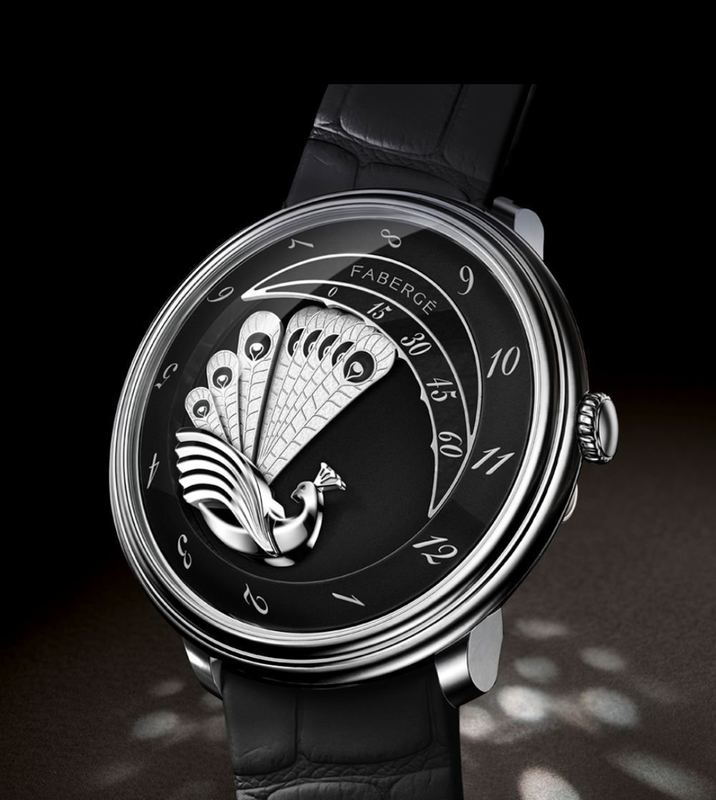 This year there is a new version for those who like their watches without stones (and their peacock more streamlined), simply called the Fabergé Lady Compliquée Peacock Black. I find myself more drawn to this new one. The real bird may use vibrancy and colour to gain attention but in a possibly counterintuitive way, black seems to draw my attention because of its absence. In comparing the two black versions, I like to think of the Black Peacock Sapphire as the Art Nouveau version and this, the Art Deco one. Hopefully, either Horologium or #thewatchnerd will be able to bring you ‘in the metal’ photos of it at some point.